Climbing a steep flight of steps may not be something that we look forward to doing. It is not only difficult to start climbing but it is also challenging to continue climbing because the thighs burn from muscular exertion and the lungs breathe vigorously due to lack of endurance. Some may avoid the painful ascent due to laziness or fear of being uncomfortable but each step upward is actually strengthening us for future climbs. At the top of the climb the view changes and we can now see things from a much better perspective. The hardships that we experience are like steps that test and transform us to see things from God’s higher perspective. The Lord can use each difficult step to develop Christlike character and strengthen our faith. Unfortunately, avoiding pain or discomfort is often a greater priority than taking a step closer to the Lord. Avoiding the climb is the same as resisting change. “Blessed are those who endure when they are tested. 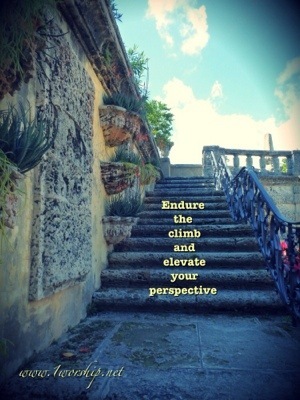 When they pass the test, they will receive the crown of life that God has promised to those who love him.” (James 1:12) Endure the climb and elevate your perspective of Jesus today. 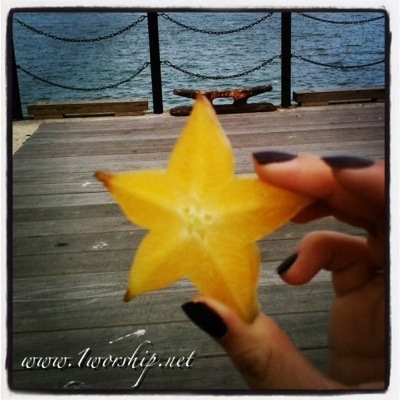 I love carambola, also known as starfruit which is the fruit of a tree native to Southeast Asia. The entire fruit is edible and they can be used in cooking, or made into relishes, preserves, and juice drinks. Ripe starfruits are sweet with the taste being similar to a mix between an apple and a citrus fruit. Starfruit is rich in fiber, potassium, and vitamin C. It also has both antioxidant and antimicrobial health properties. Amazingly, starfruit trees can produce an incredible quantity of up to 400 lbs of fruit every year under ideal growing conditions. (1) Starfruit has an average looking appearance but when prepared in a cross-section it resembles the beautiful shape of a star. The Lord Jesus considers us to be star if our lives produce good fruit. When you seek the Lord’s direction in everything that you do then “the way you live will always honor and please the Lord, and your lives will produce every kind of good fruit.” (Col 1:10) We may feel that our lives are just average but when we are prepared by the way of the cross we become a star. 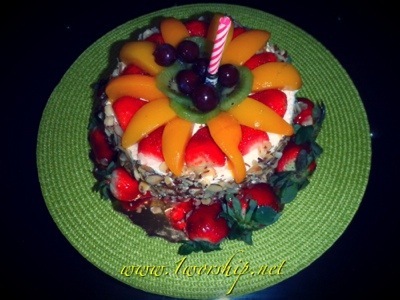 So produce good fruit and be a star! I was visiting an alligator farm recently and I noticed how the alligator keeper was very cautious when moving about his reptilian friends. He was very observant of the alligators activities to guard against any unsuspecting attacks. Even though the keeper was with the alligators every day he still could not trust his company. Hanging out with the wrong crowd can be dangerous to your health because they may end up turning on you. Good friends are hard to find. “One who is righteous is a guide to his neighbor, but the way of the wicked leads them astray.”(Proverbs 12:26) We can trust devoted followers of Christ Jesus who are transparent and honest before the Lord. 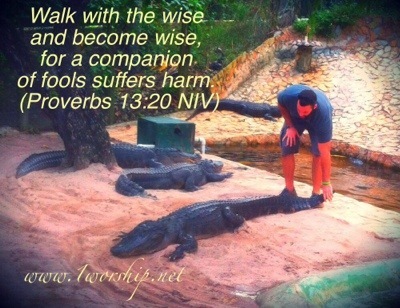 When we surround ourselves with these types of trustworthy friends the Lord can use them to guide our steps into his perfect will. Of course the Lord himself is our most trustworthy friend as he is the only one worthy of putting our trust in. 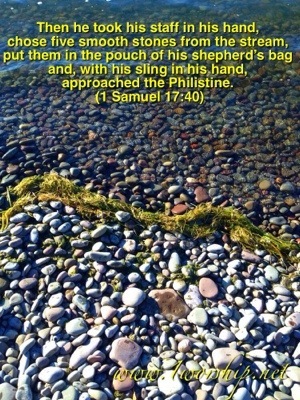 I was walking along a stream one day and noticed that there were many stones on the shore. There were large stones and small ones. There were dark stones and white stones. There were fat stones and thin ones. Some stones were prettier than others. I couldn’t resist picking up a smooth stone and throwing it as far as I could. In the Bible there was a man named David who also threw a stone. He hurled it with his sling and hit the Philistine giant named Goliath in the forehead. The stone sank in, and Goliath stumbled and fell face down on the ground. (1 Samuel 17:49, 50) David had a great victory facing overwhelming odds using an insignificant little stone. The Lord Jesus personally selects humble people of all colors, shapes and ethnicities that have been polished by the streams of living water from God’s Word to fight the giants of injustice, poverty, illness and oppression. The Lord Jesus still has more stones to throw. He precisely launches all those willing servants with the powerful anointing of the Holy Spirit to slay these giants and set the captives free. My secretary shared a portion of her lunch with me recently. When she first offered me the food I politely refused. She encouraged me again to take some of her food since it was good. I knew the food was delicious and I was hungry but again I politely refused. Finally she put a portion of her food on a plate and gave it directly to me and left the room. Of course now I could do nothing but receive the food and with gladness I ate the meal. This story reminds me of how we should come to the Lord in prayer. The Bible encourages us to pray. “Because he bends down to listen, I will pray as long as I have breath!” (Psalms 116:2) but often we ask God to take away a problem instead of giving it directly to him. 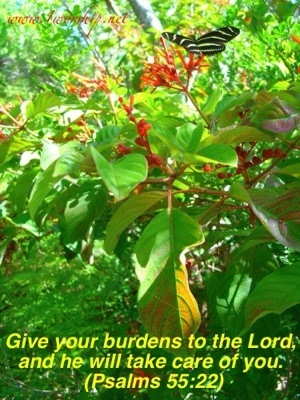 We expect him to remove the difficult situation immediately but God is a gentleman and he waits for us to completely surrender our burdens to him rather than taking them from us. Imagine if someone convinced you to steal money from your employer. You agree to go through with it and put a large sum of money into an envelope and walk out the door. What you did not realize was that the security cameras recorded the entire crime including a clear picture revealing your identity. The majority of people would never even consider stealing from the employer that signs their own paycheck but all of us are guilty of stealing from the Lord who gave us life. Everyday we have an opportunity to offer God our lives in service to him. We steal from God when we choose our own will and resist his will. God not only keeps a record of all of our actions but he knows the intentions of our hearts. God created us as his possession and provides all of our needs but he expects us to bring glory to his name. Let’s honor God in faithful service to him. I was very excited to find a new shortcut driving my car which greatly reduced my travel time on the road. After traveling this new route for a month I was very disappointed to receive a bill in the mail for an unexpected toll. I did not realize that my shortcut was a toll road enforced by video surveillance and I was being charged a toll every time I used the road. Making the wrong decisions in life can take its toll. 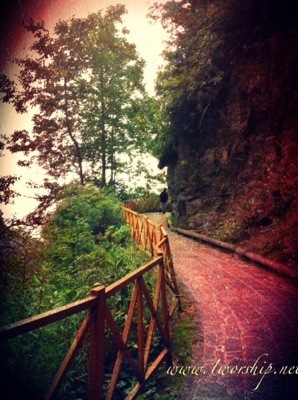 Some directions that we choose to travel end up costing us later if we are not paying attention to where we are going. The easy shortcut may seem more convenient but the Lord’s way is a very narrow and difficult road which only a few people ever find. 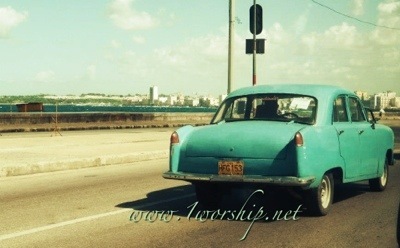 We can travel toll free following Jesus. His way is the only way. Gideon was one of the great heroes of faith in the Bible. He started out with an army of 32,000 men to fight the Midianites but the Lord reduced the number of warriors to only 300. All those who were afraid were sent home first. Then God tested the remaining men by observing how they drank water from a stream. Those who carelessly put their faces into the water were sent home but those who cupped the water with their hands to drink without occluding their vision were chosen to fight. People strive for quantity but God looks for quality. Being surrounded by a few good people who can see your vision is more beneficial than numerous acquaintances who are just focused on satisfying their own selfish interests. We can have victory over life’s problems by surrounding ourselves with a few good people who love God and keep a watchful eye open to read his Word.